In the North Sea, there is currently little history of decommissioning. According to Oil & Gas UK: ‘the total cost of decommissioning existing and sanctioned infrastructure [is likely] to be £28.7 billion from 2012 onwards. If all potential developments currently reported to Oil & Gas UK were also to be developed, this sum could rise to £35.9 billion and there would be decommissioning activity in the UKCS as late as 2060’. Latest values are up to three times this amount. How long can I stay here? OSC think it is time for a change of rules. © OSC 2015. How is decommissioning relevant to marine mammals? Offshore rig-decommissioning is a complicated, multi-disciplinary, costly and energy-consuming process, involving activities such as installation preparation, well plugging and abandonment, conductor removal, mobilisation and demobilisation of derrick barges, installation removal, pipeline and power cable decommissioning, materials disposal and site. All these activities generate underwater noise, which has potential to impact marine mammals such as seals, whales, dolphins, porpoises, and sirenians (manatees and dugongs). Are marine mammals protected by law during my decommissioning project? Regardless of decommissioning project location, there are laws protecting marine mammals. In the UK for example, marine mammals are protected by law under the UK Wildlife & Countryside Act (1981). Other agreements/rules/statutes etc. apply such as the Agreement on the Conservation of Small Cetaceans in the Baltic & North Seas (ASCOBANS) (1992), European Habitats & Species Directive (1992), Offshore Marine Conservation Regulations (2007 & amendments) – beyond 12 nm, Offshore Petroleum Activities (Conservation of Habitats) Regulations (2001), and Conservation of Habitats & Species Regulations (2010) – within territorial waters. How do I plan for marine mammals during my project? Ocean Science Consulting (OSC) work worldwide, but the UK has taken the lead concerning decommissioning and marine mammals, and many countries are adopting these measures. In the UK, the Department of Energy & Climate Change (DECC) provide regulatory guidance on decommissioning and marine mammals. It is very important to design an appropriate Marine Mammal Mitigation Plan (MMMP) early on. This assesses whether marine mammals are likely to be present near to the structure, considers any species’ seasonal trends, such as breeding, calving/pupping, and migration. A good MMMP also investigates likelihood of injury or disturbance, and implementation of mitigation procedures to protect marine mammals, but also follows Best Available Technique Not Entailing Excessive Cost (BATNEEC). This ensures that the whole project is feasible operationally, without breaching regulatory procedures, or worst, contravening law. What personnel or equipment do I require for my decommissioning project? If your project involves explosives, cutting, or any aspect of activity that generates excessive underwater noise, then regardless of project location, it is advisable to plan the work at a time of least disturbance. This is often not possible operationally, so minimum requirement is the use of trained and experienced Marine Mammal Observers (MMOs) and in the UK, to follow Joint Nature Conservation Committee (JNCC) guidelines to ensure the mitigation zone (500-1000 m in the UK) is clear of marine mammals. Prior to cutting, for example, the use of Acoustic Deterrent Devices (ADDs) and potentially Passive Acoustic Monitoring (PAM) equipment, and PAM Operators is advised. In sensitive areas (such as Special Areas of Conservation, SACs), real-time monitoring of underwater noise is prudent (www.osc.co.uk/services/underwater-noise-assessments-modelling). In Germany, if the project is inshore, Double Big bubble Net Curtains (DBBC) are used, with mixed success, but the underwater noise guidelines are very strict (see www.osc.co.uk/sectors/windfarms). Offshore, this is impractical, and OSC has been working together with their German client to find feasible (and acceptable) noise reduction measures. How many MMOs do I require? In the UK, the JNCC stipulate that in areas of ecological importance to marine mammals, or if daylight shifts are likely to exceed 12 hours (which in the Norther hemisphere corresponds to north of 57°N between April 1st and October 1st), a minimum of two MMOs are required. Do I really need PAM? In periods of poor visibility and/or bad weather, or if your operations are likely to continue into the night, the use of PAM is recommended. Most operations in the world today use PAM, regardless of project sensitivity. 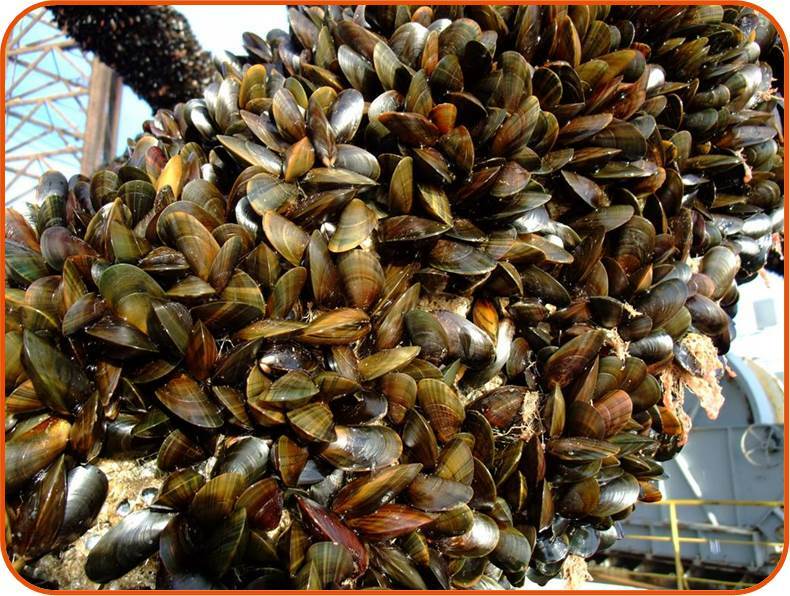 Mussels (Mytilus edulis) encrusting a jack-up drilling rig leg in the North Sea © OSC 2015. Todd, VLG (2013): Rigs – to decommission or not to decommission? Marine Scientist 43, 22-25. Todd, VLG, Gardiner, JC, and Todd, IB (2015a): Meals on wheels? A decade of megafaunal visual and real-time Passive Acoustic Monitoring detections from on-tow and stationary offshore drilling rigs and production platforms in the North and Irish Seas. PLOS One, Submitted. Todd, VLG, Gardiner, JC, and Todd, IB (2015b): Rigs-to-reefs and porpoises: Précis of evidence to support leaving offshore installations in situ at the end of their operational lifetimes: Decommissioning of Offshore and Subsea Structures. ASRANET Ltd, Glasgow, UK, pp. 10. Todd, VLG, Lepper, PA, and Todd, IB (2007): Do porpoises target offshore installations as feeding stations? Improving Environmental Performance: A Challenge for the Oil Industry, 3-4 April, 2007. Proceedings of the International Association of Drilling Contractors (IADC), 3-4 April, 2007, Amsterdam, The Netherlands, pp. 62. Todd, VLG, Pearse, WD, Tregenza, NC, Lepper, PA, and Todd, IB (2009a): Diel echolocation activity of harbour porpoises (Phocoena phocoena) around North Sea offshore gas installations. ICES Journal of Marine Science 66, 734 – 745. Todd, VLG, and Todd, IB (2007): Advice on the use of pingers (and other techniques) as marine mammal mitigation tools during offshore conductor-hammering procedures. Advice Document No. 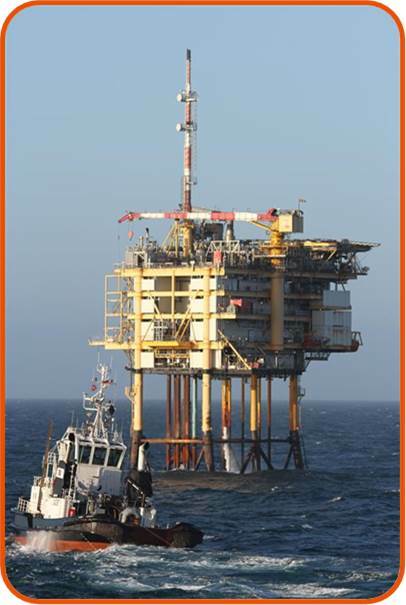 1. for Wintershall Noordzee B. V. by Appin Scientific Limited. Ocean Science Consulting Ltd., Dunbar, Scotland, UK. 56 pp. Todd, VLG, and Todd, IB (2009): Expert assessment: exploration drilling and harbour porpoises (Phocoena phocoena) in the Borkum Riffgrund SCI (German Sector): Advice Document 2. Ocean Science Consulting Ltd., Belhaven, Dunbar, Scotland, UK. 76 pp. Todd, VLG, Todd, IB, Lepper, PA, and Tregenza, NC (2009b): Echolocation activity of harbour porpoises (Phocoena phocoena) around an offshore gas production platform-drilling rig complex. Fifth International Conference on Bio-Acoustics, 31 March – 2 April 2009, 31st March – 2nd April 2009, Holywell Park, Loughborough University, UK, pp. 8. Turner, VLG (2004): Assessment of the impacts of drilling in the Dogger Bank region: preliminary proposal to monitor the environmental impacts of drilling for oil and gas on marine mammals in a candidate Special Area of Conservation in the offshore environment. Appin Scientific Limited, Appin, UK. 17 pp. Turner, VLG, Doble, MJ, and Lepper, PA (2005): Acoustic, oceanographical and visual measurements from a jack-up drilling platform in the Dogger Bank region of the North Sea: potential impacts on marine mammals. Appin Scientific Limited. Appin, Argyll. 122 pp. Turner, VLG, and Todd, IB (2006): A six-month study of harbour porpoise (Phocoena phocoena) activity around a gas production platform/drilling rig complex in the North Sea (2005-2006). Technical Report no. 2. Appin Scientific Limited. , Dunbar, East Lothian. 72 pp.